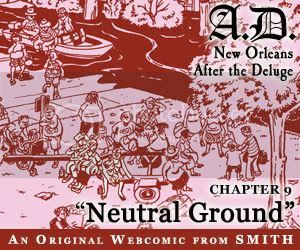 After a bit of a hiatus, A.D.: New Orleans After the Deluge is back, with a new installment, “Neutral Ground.” In this chapter, we check in with Hamid & Mansell as they wake up from a long night on the roof of Hamid’s maintenance shed. The mosquitoes were out in full force — and other critters are about as well. Meanwhile, Denise & her family have momentarily escaped the water, and are waiting for transport out of the flooded city. And in Houston, Leo & Michelle are using the Internet to determine how much water hit their neighborhood. It is Wednesday, August 31, two days after Katrina.